It's Lovely! I'll Take It! : Thanks, fairy godmother! Don't blame me, I didn't decide on it - I try to avoid saying it if at all possible! Wow. That house looks like it is probably as quiet as death in there. Honestly, it's kind of creepy, particularly when you factor in that the walls are almost entirely bare. It might just be staged for sale, by quite possibly the worst stager on earth, but that is the most sterile looking house. I'm just saying, it makes the inclusion of the girl in blue that much weirder. "Lifeless. Lifeless. Oh, look, more lifelessness. And a biped. Crap, I hope she's alive." Maybe Disney is finally in the real estate biz. They have their fingers in everything else. Utahn? Seriously? Utahnian would be better. Utahster, perhaps? I like Utite too. Oooooo, card board cut out person on steps???? Or dress code for persons standing on the street????? ?Hey did they photoshop their lawn? their trees? their house? Argh I need to run away it's like a film set, yeah that's it, it's Truman. Maybe an LDS wife out in the burbs, a la Big Love. Yep, that's what I thought. 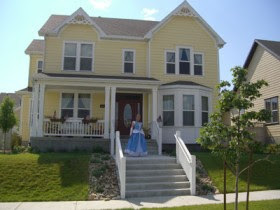 The other wives are inside - Belle, Sleeping Beauty, Snow White, and of course Ariel is in the pool out back. Aha! I wonder if the house comes with a cleaning contract with singing woodland animals? That might explain the interior. How would you pronounce Utahan? At least Utahn doesn't make you sound like you're having breathing problems when you say it. No no no.... the correct term is Utard. Hm... I don't think I'd want to live there. I've heard about the royal messes those stepsisters made, and paint and Pinesol can only go so far. Plus I would want to kick the talking mice out, but would feel bad after all they did for Cinderella. It's true; Utahn is the most widely accepted. Though Utard is not uncommon, among the "in Utah, but not of Utah" population. Personally I could go for an adoption of Utahstic. My guess is that's the teenage daughter dressed up for prom or "preference" or "special," as I believe some people call it around there. I see it's been made clear that it's Utahn. For what it's worth, I'd rather be known for the town I live in, which would make me a Moabite. Yeah, that sounds better than Youtahn. LOL. Hello Danny. Come and play with me. Come and play with me, Danny. Forever, and ever, and ever. if she can be a Moabite then I can kick the Utahn from myself as well... now I'm just a St. Georgian? Hey Lauren...a Ute is a young person from Utah. And my husband thought he was being so original when he called me a Utard. Not that he has any right to tease me as a Michigander. Seriously, "gander?" And by the way, only in Utah is a picture showing a view of the Temple a selling point. I was a Utahn, too, but I guess you could call me a Cottonwood Hight-ite...? Actually, this house is a bargain. I bet the bare walls are a result of selling/pawning things off to try to avoid foreclosure...they probably couldn't afford the rediculous property taxes+the mortgage. Poor Cinderella is actually going from riches to rags. Really?? Isn't there a sports team called the Utes? Utes... I don't know about sports teams, but I believe there are Ute Indian tribes. The inside actually looks JUST LIKE the interior of Margene's house on Big Love... since she spends all her time at the other houses and hasn't bothered to decorate.